FILE - Policemen (in blue uniforms) keep an eye on protesters during a rally in Khartoum, Sudan, May 22, 2015. The United States has condemned Sudan’s arbitrary detention of journalists after reporters from the French news agency (AFP) and Reuters were arrested covering a street protest Friday. The U.S. State Department said it was aware of the detentions and was closely following the reports. “We condemn the harassment, arbitrary detention, and attacks on journalists in Sudan who are doing their jobs and exercising their fundamental right to freedom of expression,” State Department spokeswoman Heather Nauert said in a statement. The U.S. is continuing to press Sudan to improve its performance regarding freedom of expression and overall human rights and “to ensure that those detained are treated humanely and fairly, in accordance with Sudanese law and international human rights standards, and that they are allowed access to legal counsel and their families,” Nauert said. 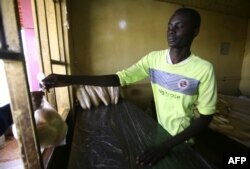 A Sudanese man hands a bag of bread to a costumer at a bakery in Khartoum, Jan. 5, 2018. Angry Sudanese queued outside bakeries in Khartoum as bread prices doubled overnight, with bakers blaming a government decision to stop importing wheat. Widespread protests and clashes with security forces erupted in Sudan this month after Khartoum imposed tough economic measures in line with recommendations by the International Monetary Fund. Abdelmoneim Abu Idris Ali, 51, of AFP and at least two other journalists, one a Reuters Sudanese stringer, were taken away by authorities Wednesday as they reported on a demonstration against rising food prices. They are being held in a detention center “for investigation” by Sudan’s National Intelligence and Security Service (NISS), Sudanese authorities are quoted by both news agencies as saying, and have not been allowed any contacts with their families or employers. AFP said its management strongly condemned the arrest of Idris Ali and asked for his immediate release. Reuters said it did not know the circumstances of the detention and was actively seeking additional information about the situation. The New York-based Committee to Protect Journalists (CPJ) said in a statement Thursday that a total of seven journalists working in Sudan had been arrested, and it called for the immediate release of all the reporters. Reporters Without Borders (Reporters sans Frontières, RSF) ranked Sudan the 174th worst out of 180 countries in its 2017 World Press Freedom Index. Critics have accused President Omar al-Bashir’s regime of cracking down on the media.